You are currently browsing the category archive for the ‘Hadley’ category. This recipe is hands-down one of my favorite of 2010-11. I’ve made it 4-5 times in the past month, enjoyed leftovers for lunch, served it to guests… it’s never let me down. It’s quick and easy and makes several servings. Plus, it’s full of butternut squash (which will ward off sweet cravings), kale (a superfood! ), and yummy black beans. I serve it with a side of brown rice and, depending on how hungry I am, a side of steamed broccoli. 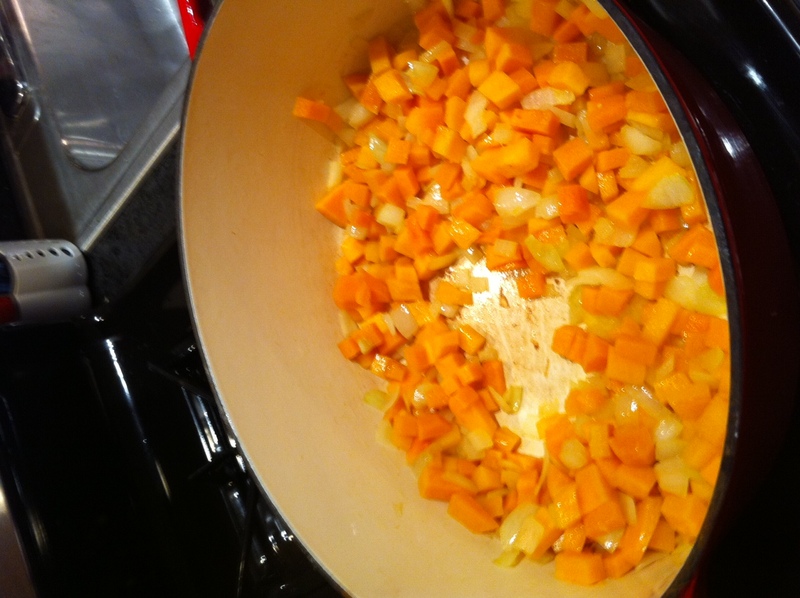 In a large pan, heat olive oil and add onion and butternut squash. Cook on medium for 4 minutes, until both are soft. Add spices and cook for 30 second, stirring frequently. Add kale and cook for another minute. Add tomatoes and beans and stir everything together. Cook 2 minutes. Add 2c of water (or vegetable broth, if you’d like), cover, and simmer for 15-20 minutes, until everything is tender. Salt at the end — the tomatoes will cook down and it’s easy to oversalt! We’re excited to launch Be Well: a virtual book club for people who want to explore their relationship with their body, mind, and spirit in a supportive environment — free of charge. The first book that we will read is Geneen Roth’s bestselling Women, Food, and God. Each week we will explore a chapter of the book in our exclusive online forum, giving participants our thoughts on and encouraging feedback about the material. Join this special community today. Once you register, you will receive access to the forum. On November 8th, we will begin the discussion of Chapter One. Be prepared to re-discover old favorites and learn new things about yourself in a supportive environment. We invite you to purchase the book from our Amazon.com store. For added convenience, we have also listed our next book, The Four Agreements, should you wish to purchase them both at once. Maybe it’s Halloween, maybe it’s the cold weather… but I’ve been craving pumpkin. Specifically, pumpkin pie. 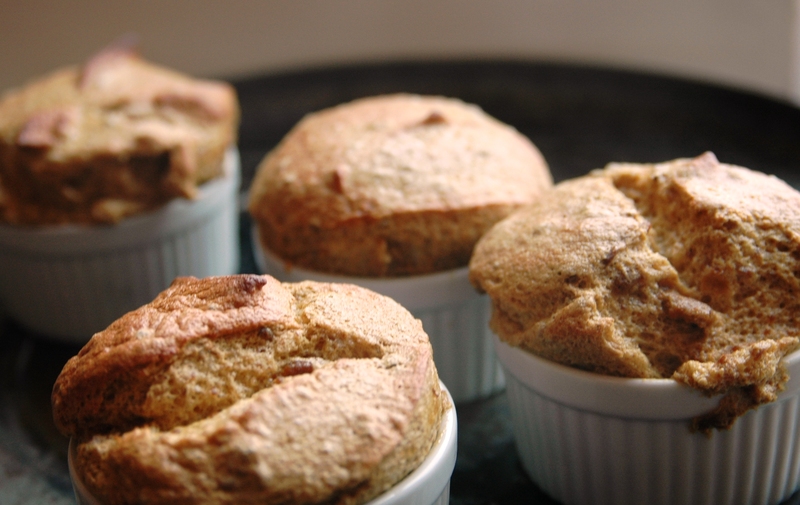 While on the search for a new recipe, I came across a new recipe, courtesy of Epicurious: ginger-pumpkin souffle. It promised me a light, not too sweet dessert experience, which was 100% spot on. The fact that it was dairy-free (soy milk!) didn’t hurt matter either. Preheat oven to 375°F. Butter 8 6-ounce ramekins. In medium, heavy-bottomed saucepan over medium heat, bring soy milk to boil. Add ginger, remove pan from heat, cover, and let steep 30 minutes. Strain soy milk, discarding ginger, and set aside. In large nonreactive bowl, whisk together egg yolks and 6 tablespoons of sugar. Whisk in flour until well combined. Gradually add hot milk, whisking constantly to prevent curdling. Return yolk mixture to saucepan and set over medium heat. Cook, whisking constantly, until custard boils and thickens enough to coat back of a spoon, 2 to 3 minutes. Transfer to large bowl, whisk in pumpkin purée, and set aside. Using electric mixer with whisk attachment, beat egg whites until foamy and slightly opaque. With mixer running, add remaining 6 tablespoons sugar, 1 tablespoon at a time, then beat until stiff but not dry. Fold 1/3 of egg whites into pumpkin mixture to lighten, then add mixture to remaining whites, folding in gently but thoroughly. Spoon batter into ramekins, filling almost to top, and lightly run finger around inside rim to create a “moat.” Place ramekins in large baking pan. Place baking pan on middle oven rack and add hot water around ramekins to depth of 1 inch. Bake until soufflés have risen well above rim and tops are golden brown, about 25 minutes. Serve immediately. I was recently luck enough to receive a sample of Purely Elizabeth‘s spanking-new gluten-free cookie line. A while back, I reviewed their muffin mix, which I loved and still use to this day — so I was excited to try the cookies! The cookie mixes are available in three flavors: Chocolate Chip, Oatmeal Cinnamon Raisin, and Oatmeal Cherry Chocolate Chip. Each mix is gluten-free, vegan, and free of refined sugars. All you need for a delicious, healthy batch of cookies is some olive oil and unsweetened applesauce. First, whole grains. I’m SO tired of gluten-free products made from refined grains — meaning no health benefits, no fiber — just pure, unadulterated carbs. These cookies, though, were made from a mixture of organic millet, fava, and almond flours. Gluten-free AND healthy. 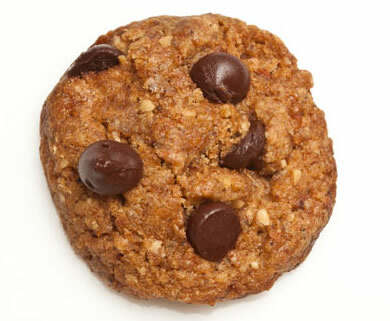 While we’re talking about fiber… each cookie has 2g of fiber, thanks to the whole grains and chia seeds. No refined sugar. Another one of my gluten-free pet peeves — most products are filled with sugar. The Purely Elizabeth mixes use organic coconut palm sugar. I had never heard of this, but was pleased to learn that this sweetener has a low glycemic index and is one of the most sustainable sweeteners in the world. I was worried it would have an after-taste, like stevia and sometimes agave nectar, but was pleasantly surprised that it has caramel-y undertones. YUM! I really enjoyed the cookies — the taste of was spot on. Just sweet enough and full of flavor. I brought a batch to work for my colleagues to sample. My favorite comment: “I have no idea what that is… but I really like it.” Another colleague, who is a bit of a health but, ran over to ask if the cookies had chia seeds in them. When I said yes, she squealed, I LOVE chia seeds! They were a hit. The one small problem I had with the cookies were the texture. I liked that they were chewy. (If you like crisp cookies, this may not be the right product for you). But I did find them a bit too grain-y. It was almost like I was eating something a bit TOO “granola-y”. That being said, I think all of the Purely Elizabeth products (cookies, muffins, pancakes) are the best gluten-free mixes on the market. They’re actually good for you — not junk food masquerading as healthy foods. Anyone who’s attempting to live gluten-free should definitely check them out — they’re delicious and save a lot of time. Here in New York City, it’s apple season. Apples are everywhere! In honor of the apple harvest and the first days of fall, I wanted to share one of my favorite apple recipes. It’s super quick and makes for a great breakfast — or even dessert! Heat skillet over medium heat. Add butter. Once it has melted, coat the bottom of the pan with it. Add apples. Sprinkle spices on top and stir around. Cook for 4-6 minutes, stirring on occasion. 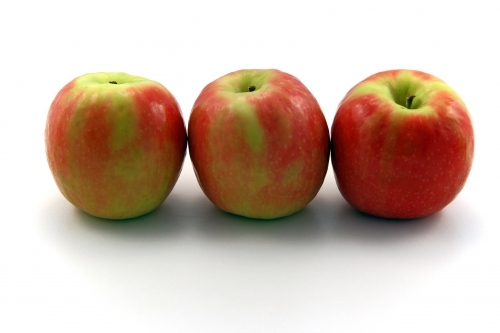 When apples are tender, remove from heat and serve warm. Leftovers can be re-heated or diced up and stirred into oatmeal. You may have guessed that I’ve been on a rice kick lately! This is a super simple recipe I came up with on the fly–totally based on what was in my refrigerator at the time. To make it in a pinch, use leftover rice–you can use any variety. I used a mixture of brown rice and Japonica, which is nuttier in taste and dark in colour. The entire pot of rice will turn blackish–very lovely against the white tofu. This is surprisingly tasty, considering how simple it is. It’s slightly spicy and very sesame-y. Cook rice according to these instructions, or use leftover rice. In skillet, heat olive oil. Once very hot, add tofu. Cook for 5 minutes, turning once. Tofu should become brown on at least one side and, hopefully, crispy. Add in red peppers and saute for 1 minute. In a separate skillet, heat sesame seeds for about 1-2 minutes until they are toasted (lightly brown). Add sesame seeds, sriracha, and toasted sesame oil to tofu and peppers. Stir in rice and toss until well combined. Salt to taste. Serve immediately. Only 3 days left to take advantage of our early bird special! Fall is the perfect time to reboot your system and clean up your routine before the holiday season and help ease the transition between seasons. 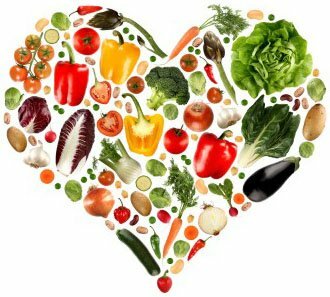 Now is the time to refocus, re-energize, and renew your commitment to your health. All registered participants will also receive a recording of the call. *Spark! Clients, health practitioners, and bloggers receive an addtional discount. Click HERE to learn more. Pre-heat oven to 375 degrees. Mix all of the ingredients into a large bowl; transfer to a casserole dish. Cover and bake for an hour; stir halfway through. Remove from oven and let sit for 15 minutes. Enjoy!